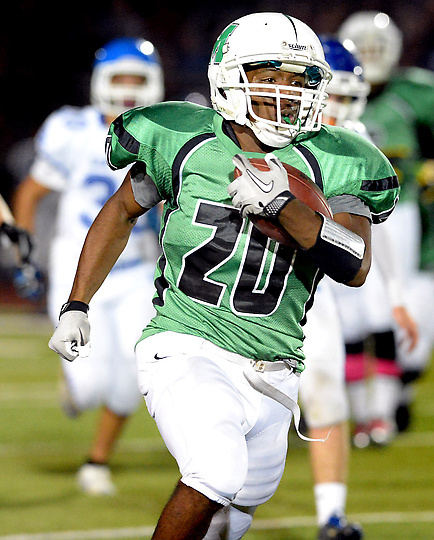 Is a state bowl in Monrovia’s future? STATE BOWL BOUND: Monrovia could find itself in a state bowl game if it keeps winning. Staff photo by Sarah Reingewirtz. Monrovia is hoping to capture its third consecutive CIF-Southern Section Mid-Valley championship this year. But if the Wildcats are able to grab another crown, it may get them an invite to the CIF State bowl round. Monrovia (7-2), after a 21-16 victory over San Marino that got it a share of the Rio Hondo League, has moved up to No. 3 in South Division III, trailing No. 1 Paraclete (8-1) and St. Augustine (7-2), of San Diego. The ‘Cats could move into the coveted top two slots with an expected win over Temple City and a loss by Paraclete to Sierra Canyon (9-0), which is No. 1 in Division IV. But Monrovia could also get there just by winning the Mid-Valley Division, because by doing so, Paraclete would have a loss, allowing Monrovia to move on up. PASADENA – Muir High School has recovered from a slow start to become one of the top football teams in the CIF-Southern Section Southeast Division. A big key for the Mustangs, who have won six consecutive games going into Thursday’s 59th Turkey Tussle against rival Pasadena at the Rose Bowl, is wide receiver Lamarr McDaniels. The senior, along with quarterback Joshua Muema-Washington, have been the glue that has kept Muir, ranked No. 4 in the Southeast Division, together. “He’s (McDaniels) one of the guys that kept the drive,” said Muir coach John Hardy, whose Mustangs are 6-3 overall and 6-0 in the Pacific League. “When we were 0-3 after losing to Rancho Cucamonga, we had a team meeting and he was one of the (players) who called the team meeting. McDaniels’ view is that something needed to be said after Muir opened with consecutive losses to Upland (34-6), Alemany (49-12) and Rancho Cucamonga (54-14). He had high expectations after Muir advanced to the divisional semifinals last season, and was going to make sure the players righted the ship. 1. Monrovia (9-2) – The back-to-back defending Mid-Valley Division champions are likely to receive the No. 2 seed when playoff pairings are announced Sunday. Monrovia is also in solid position for a state bowl after receiving the No. 3 ranking in Cal-Hi Sports state bowl rankings for Division 3. If they win the Mid-Valley, beating Paraclete in the process, a 15-game season is within reach. 2. 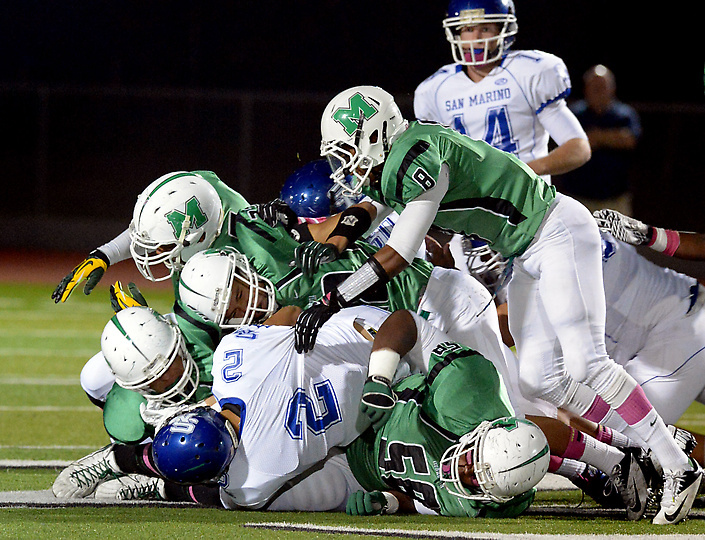 San Marino (8-1) — It’s hard to knock down the Titans after giving Monrovia more than it wanted on Friday. They are No. 5 in the Mid-Valley, so I wouldn’t be surprised with a Wildcat-Titans final. 3. Rio Hondo Prep (7-1) — The Kares have played their way into a No. 2 seed in the Norteast Division. But first they need to take care of business vs. Poly on Friday. 4. La Salle (9-0) — The surprise team of the year is the area’s only undefeated team. They’ll make some noise in the Northwest. 5. Muir (6-3) — The Mustangs have come all the way back to win the Pacific League. They’ll make a run in the playoffs, but first some unfinished business in the Turkey Tussle. 6. Gabrielino (7-2) — The Eagles play for a playoff spot when they they host Arroyo for third in the Mission Valley League on Friday. A loss could put them on the wrong side of the bubble. The 7-3 record would be impressive, but the strength of schedule is not. 7. St. Francis (3-6) — The Golden Knights, who finish with St. Paul, can apply for an at-large bid to the Western playoffs. But it’s highly unlikely they would get it. 8. Arcadia (4-5) — It’s all about the W for the Apaches, who clinch a playoff spot with a victory over Crescenta Valley on Friday. 9. 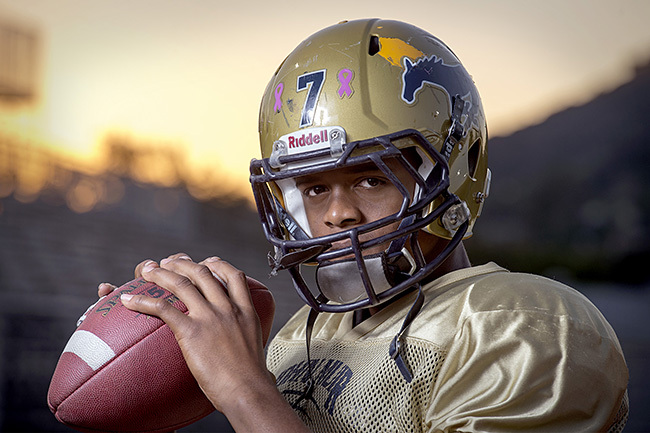 Alhambra (4-5) — The Moors control their own destiny to the playoffs. Win and they’re in, lose and it gets tricky. 10. South Pasadena (6-3) — The Tigers likely get in the playoffs with a victory. But they face a monumental task against San Marino. Likely not happening. The Rest: 11. Temple City (5-4). 12. Duarte (4-5), 13. Flintridge Prep (5-4), 14. Pasadena Poly (6-2). 15. Rosemead (3-6), 16. Maranatha (3-6) 17. San Gabriel (2-7), 18. Pasadena (1-8), 19. La Canada (1-8); 20. Bosco Tech (1-8), 21. Marshall (3-7), 22. Keppel (0-9); 23. Blair (0-9). Star-News Pick’em: Muir looks to add to its Turkey Tussle win streak…does it? Keith Lair and I will go head-to-head in the Star-News Pick’em. Here is this week’s predictions along with how we did last week. Last week: I got the edge on Keith, getting him with picks of El Monte beating Gabrielino and Arroyo over Rosemead. He got me with Bell Gardens win over San Gabriel. This week: The game of the week is the annual Turkey Tussle between Muir and Pasadena. There are no playoff implications, but the Turkey Tussle is never a — and forgive me Jim Mora — a useless game. I like the Mustangs, who are riding a six game winning streak after locking up the Pacific League title with a 38-0 victory over Arcadia. Pasadena has puncher’s chance. The Bulldogs last win in the series was a 14-7 victory in 1995. There are other games with playoff implications, including Rio Hondo Prep vs. Pasadena Poly; Alhambra vs. San Gabriel and Maranatha vs. Village Christian. I like the Kares, Moors and Minutemen. Contrary to what is published on the maxpreps and calpreps websites, the annual Turkey Tussle between Muir and Pasadena high schools is scheduled for Thursday at the Rose Bowl. Game time is 7 p.m.
Muir is 6-3 overall and 6-0 in the Pacific League. The Mustangs clinched at least a share of the league title with a 38-0 victory over Arcadia last week. Muir, by virtue of its 24-17 win over Burbank two weeks ago, will be the league’s No. 1 representative for the upcoming CIF-Southern Section Southeast Division playoffs. Pasadena is 1-8 and 1-5. The Bulldogs lost 31-21 to Burroughs last week.